My hairdresser has been cutting my hair for years, and recently when I went back, I noticed a new bakery opening nearby along the shophouses. What caught my interest was it’s name, Boulangerie. With a french name like this, I knew it could not be some typical humble neighbourhood bakery. Curious about their offerings, I decided to step in for a peek. The chef came out to introduce herself as I was perusing over the menu at the counter. She was trained in Le Cordon Bleu, London, and decided to come back to open a bakery. Isn’t this everyone’s ( well almost everyone’s) dream? It was interesting to hear her relate her tough experiences working with eccentric french chefs with little patience. When making my choice for french cakes, I look for multi-component cakes that involve a few textures, uncommon flavour combinations and of course, good craftsmanship. 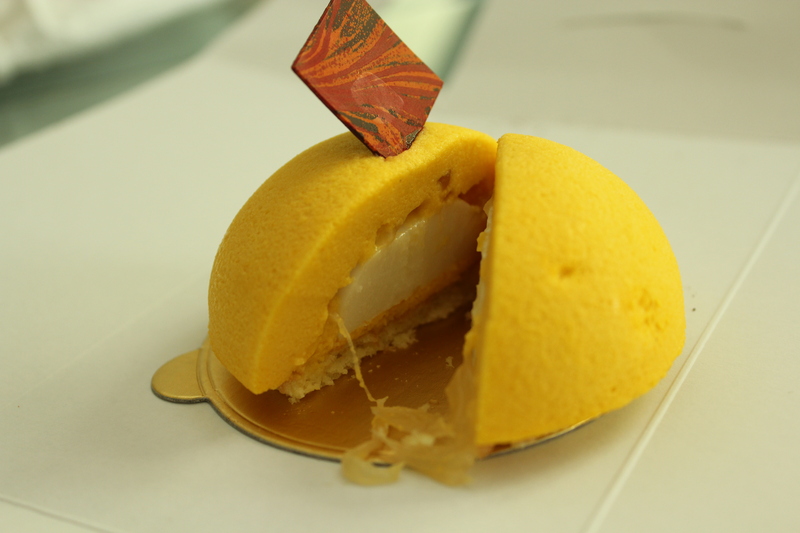 The rich yellow color of Mangue looked so bright and cheery, and the dome shape gave it a more sophisticated appearance. As soon as I was told that there was coconut jelly and pomelo inside the mango mousse creation, I made my choice instantly. The mousse turned out to be a disappointment unfortunately- it just reminded me of why I hate mousse and it’s even lesser relation, whipped cream so much. It was far too airy and coupled with the excessive amount of gelatin added, all I tasted was creamy sponge. Loved the intense tangy mango flavour but seriously, how can I enjoy it with mousse that resembles whipped cream out of a can? Sigh, I need to go back to kki for kinabaru or use a more economical way: make my own. But just when I thought all was lost, the coconut jelly saved the day! It was very chewy with a light coconut fragrance. 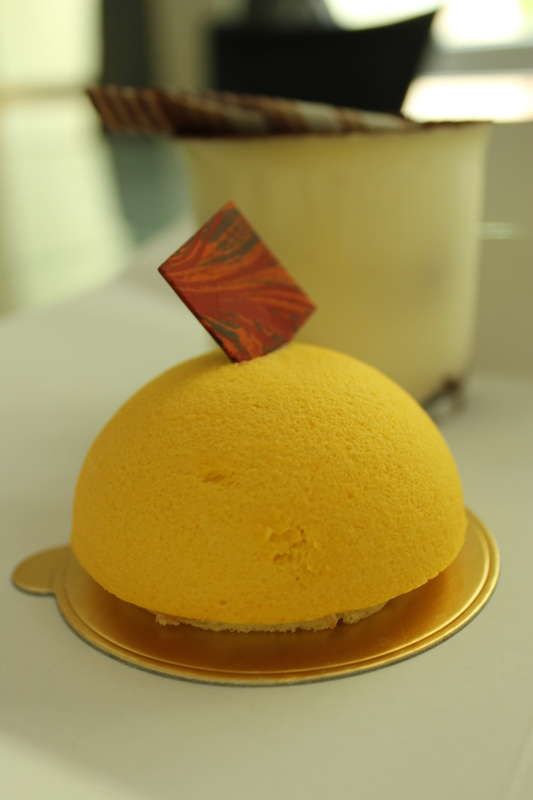 The bouncy texture added a new dimenson to the whole dessert and covered up the airiness and stiffness of the mousse. The pomelo was really superfluous in my opinion as the few miserable bits of pulp which have very little flavour in the first place paled in comparison to the easily discernable flavour of mango. This has alcohol, kalua to be more exact. The mascarpone had way to much heavy cream incorporated, leaving dad extremely displeased. Sorry, we prefer the traditional recipe of whipped egg whites! The first layer of sponge was not moist enough but the bottom sponge layer was very wet, with all the goodness of coffee and kalua soaked into the sponge. Pity the mascarpone was too creamy or it would be a pretty good rendition. Granted, the name of this shop is Boulangerie so it should be more famous for it’s baked bread. I remember the chef telling me that their breads are baked in intervals to maintain freshness and judging by her enthusiasm about her croissants, they must be one of her signatures. Well, looks like I should be buying bread the next time I visit after a haricut!